Great news from the TechEd front for Zenprise – the just-released Zenprise for BlackBerry is a finalist for the Best of TechEd 2007 award in the Mobility category! That’s 2 years in a row – probably a first for any company, for 2 different products in 2 different categories! 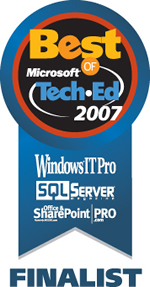 Last year at TechEd, Zenprise for Exchange was a finalist and won the Best of TechEd 2006 award in Messaging category by Windows IT Pro [read previous post “Zenprise wins Best Of TechEd 2006 award“]. Zenprise for BlackBerry brings the same automated troubleshooting, root cause analysis and performance management capabilities to Research In Motion’s BlackBerry Enterprise Server for Exchange. It automatically detects problems that affect BlackBerry availability, performance, and integrity – including user-facing issues like one-way synchronization of Calendars, issues with carrier networks like Cingular, T-Mobile, Verizon, etc., and those affecting RIM’s SRP network. (In fact, Zenprise was able to provide advance warning of RIM’s recent network outage that impacted BlackBerry users in N. America. Read previous post “Zenprise proactively detects BlackBerry N. America outage!” for more details). An added benefit for Zenprise for BlackBerry customers is the ability to manage BlackBerry from within the Microsoft Systems Center Operations Manager (SCOM) 2007 console, using the Zenprise Connector for SCOM 2007. Clearly we’re very excited about being a Finalist again for Best of TechEd 2007, and even more so about the next release of Zenprise for BlackBerry – currently in beta, and the interesting capabilities it brings. Previous post: Will Microsoft do a Linux?